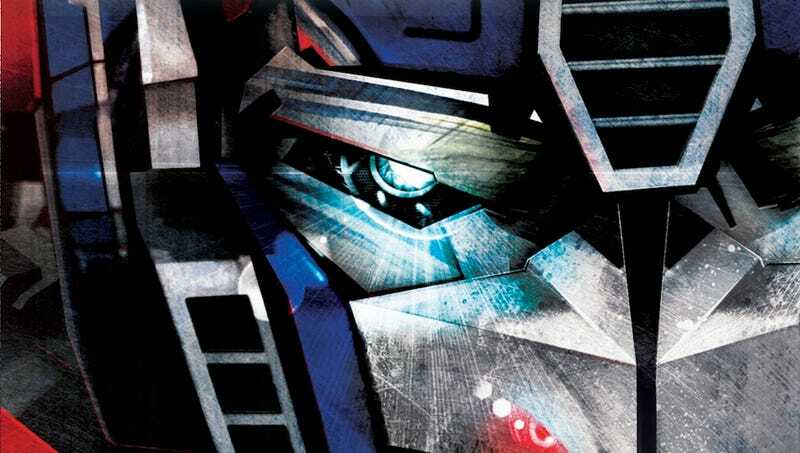 Read an exclusive preview of the new Transformers novel Retribution! The Autobots and the Decepticons fought each other for centuries before they came to Earth. Now the upcoming Transformers novel Retribution, by David J. Williams and Mark S. Williams, aims to reveal what happened when the Transformers fled Cybertron to head here. And we have an exclusive — and massive — preview! The book is set after the events of the War for Cybertron and Fall of Cybertron games, and before the Transformers: Prime cartoon, but editor Frank Parisi promises any fan of the original series will enjoy it — especially as it’s filled with classic characters “reintroduced” to the new continuity, but based on their Generation 1 counterparts. This includes everybody from Ultra Magnus and Perceptor to Blaster, Kup, and even Wreck-Gar and the Junkions! On the Nemesis, one of the screens began flashing. Soundwave leaned forward. “Bring up the visuals,” Megatron said. “At once.” The images of Silverbolt, Air Raid, Slingshot, Skydive, and Fireflight came into crisp focus on the targeting scanner. The Autobot fighters were flying fast in close formation. Starscream snorted in disgust. “Five seconds to tractor-beam range,” Soundwave confirmed. The Aerialbots dodged past the last wave of gunnery, roaring above the top decks of the Nemesis, heading in toward the bridge. “Do your worst,” Megatron said with a sneer. Instead of opening fire, they closed on one another, simultaneously shifting into alt-mode and using their forward momentum to merge abruptly, creating a single colossal silver-and-red jet trooper that proceeded to land on top of the Nemesis, wielding the largest electrostatic rifle any of the Decepticons had ever seen. “I AM SUPERION!” yelled the giant combiner robot as it fired a bolt of energy at the Nemesis’s bridge, scoring a direct hit. For a moment the entire bridge was filled with lightning; electrical feedback flashed through the Nemesis like wildfire, blowing out consoles all over the ship. Soundwave and Starscream were hurled back into the far wall. Only Megatron remained on his feet. His soldiers were already on it. All over the Nemesis hatches opened; Decepticons poured out to face the behemoth astride their spacecraft, buzzing around Superion like angry bees while the Nemesis’s batteries opened up at point-blank range, sending missiles, lasers, and superheated plasma streaking toward Superion. Multiple hits and explosions knocked the massive rifle from his hands, but he just reached down, digging his mighty fists deep into the Nemesis’s hull, tearing off a huge piece of plated armor and using it as a shield to ward off the incoming fire. Then he strode straight toward the bridge, right at the Decepticon leader, his booming voice lost in the vacuum but vibrating through the hull of the ship. “You’ve got it the wrong way around,” said Megatron. He amped up his fusion cannon and let fly. The blast was like a supernova going off. As the glare dimmed, Megatron fully expected to see Superion’s smoking wreckage. Except there was no sign of Superion anywhere. Megatron adjusted his optics. Had the cannon disintegrated the giant robot entirely? It couldn’t have—the gun wasn’t that powerful. Not against a bot the size of Superion, at any rate. Megatron stormed forward out of the remnants of the bridge, across the hull of the Nemesis. It suddenly occurred to him that there was only one place Superion could have gone, one single place he could have sought safety. As he reached the spot where Superion had been standing, his suspicions were confirmed: He saw the gaping hole in the hull of the Nemesis even as he heard the alarms wailing from deep within. Several levels below, Superion was ripping his way through floors and ceilings, pulling Decepticons apart with his bare hands as he tore his way into the depths of the Nemesis. He was making for the ship’s hangar bays, where he knew he’d have more room to maneuver. Nothing in this ship could stop him. The only thing he had to worry about was Megatron, and he had a head start on the Decepticon leader. In the meantime he was doing as much damage to the ship as he could. Once he was in the hangar bays, he’d be adjacent to the engines, and then he could quickly turn the Nemesis back into a glorified space station. Without propulsion, the ship’s pursuit of the Ark would be at an end, and the Decepticons would be left stranded in this sector of space. Superion tore through another wall and emerged into the first of the hangar bays. The Decepticons had had enough time to get their defenses together now; they’d realized that an implacable enemy was loose inside their flagship and had taken steps to trap him. Superion smiled as he saw the several squadrons of Vehicons who awaited him. “Not so fast,” said a voice. Megatron emerged into the hangar bay with an enraged look on his face. But his voice was disconcertingly calm. Superion laughed. “I’m not planning on dying.” Abruptly he brought up his gun and fired, missing only because Megatron was already switching to spacecraft mode and roaring straight toward him. Superion didn’t have time for a second shot; Megatron struck him in the chest, knocking him sprawling and sending his rifle flying. Superion lunged out to grab Megatron, but the Decepticon leader was too fast, gunning his retros and streaking back out of reach, shifting back into humanoid form and aiming his fusion canon as he did so. “GET OFF MY SHIP,” he bellowed. This time Superion had nowhere to hide. The shot blew him straight through the hangar door and into space, flinging his component bots out in all directions, streaming flame behind them, blaring out automated distress calls. Megatron wasted no time savoring his triumph; he stormed back to what was left of the bridge and plugged directly into a console to take personal control of the Nemesis. The Ark had used the distraction of Superion to pull away from the Nemesis, but now Megatron poured all reserve power into the forward engine banks, swooping in toward the Ark. Starscream pulled himself to his feet and looked up, dazed, through the remnants of the bridge’s roof as space raced past. “I’m winning,” Megatron said as he activated the tractor beam. Sideswipe’s scanners confirmed the worst. Superion’s gambit had failed, and now nothing stood between him and the Nemesis. The Ark was rocking under the renewed bombardment, the rear shields were disintegrating, and as smoke began to billow from the consoles around him, he came to a grim conclusion: The safety of the Ark and its crew was secondary. The primary goal was to make sure that Optimus survived, and alone down on the planet he wouldn’t have much of a chance against even a damaged Nemesis. Sideswipe knew that Megatron would have no compunctions about raining down bombs until nothing was left, that he’d happily kill every living thing on Aquatron if he thought it would destroy Optimus Prime. And that couldn’t happen, for Optimus was the light and the hope of all Autobots. Optimus held the Matrix of Leadership, without which the AllSpark could never be recovered. Sideswipe keyed the ship’s intercom and gave what he knew would be his final order. “All hands abandon ship! I repeat all hands abandon ship!” Escape pod launch lights went green as the Autobots followed orders and ditched. The primary launch bays disgorged a wave of support craft, and even as they did so, the Nemesis caught the Ark in its tractor beam. But that was just fine by Sideswipe. He was now the sole Autobot aboard the Ark; he swung the ship around, aiming it straight at the Nemesis, and then hit the throttle, coaxing the damaged engines to the limits of their remaining capacity, the Decepticon tractor beam inadvertently working in his favor, accelerating his kamikaze run toward the Nemesis. The Autobots would lose the Ark, but the Decepticons would lose everything. And Sideswipe would die free, at the helm of his beloved ship. He watched as the Nemesis rushed toward him. “They’re coming straight at us,” Starscream yelled. That was the last thing Megatron had expected. For Optimus to get his lieutenants to embark on suicide runs was one thing, but now the entire Ark was doing it. For the first time it occurred to Megatron that Optimus might not actually be on the Ark, that there was some larger scheme afoot that he had missed. But right now he had more pressing problems. “Reverse polarity on the tractor beam!” he screamed. “Evasive action! Hit that thing with everything we have!” The tractor beam switched to repel, but the Ark’s momentum was still carrying it forward. The Nemesis raked the Ark with withering fire, revving its thrusters in a desperate attempt to get out of the way of the oncoming Autobot ship. Megatron watched as the Ark filled his field of vision. He heard Soundwave saying something about how he was picking up an energy burst from the planetary rings—that they were changing color. Megatron marveled at his lieutenant’s capacity for trivial detail, for the Ark was almost on top of them. He braced himself to leap from the Nemesis. And then everything went crazy. There was a sudden flash from the planet’s innermost ring. A massive electromagnetic pulse struck both ships, which instantly lost all power. For a moment so did Megatron—then his backup systems came online. He switched on his own sensors and looked around. The darkened Ark was spinning off at an angle from the crippled Nemesis. “What just happened?” Megatron demanded to know. That was when Megatron received a beacon emanating from the planet below. “I fear you are mistaken,” said the voice of the Curator. Megatron thought fast. “What lies has Optimus told you?” he asked. “Like we’re doing now?” Megatron said scornfully. Megatron looked at the darkened Nemesis around him and realized he had no choice. For all he knew, the Curator really wasn’t in league with the Autobots, but in that case, the Autobots were in the same predicament he was. In order to defeat this Curator, he would have to play along. He needed more information. And then he would crush them all. “I accept your invitation,” he said. “Here are the coordinates,” said the Curator. The Autobot shuttle sped south toward the location specified by the Curator. Optimus had no idea what was there, but it didn’t look like he had much of a choice. The Curator had kept his promise to deal with the Nemesis, but he’d also shut down the Ark. The leader of Aquatron held all the cards now, so he might have been forgiven a sly smile as his face appeared on a screen in the cockpit. But Optimus refused to show any weakness. “What have you done with the Ark?” he demanded. But the screen had gone blank. “I don’t like this one bit,” Prowl said. “He’s got us by the circuits,” Jazz muttered. “But he did stop the Nemesis from destroying the Ark,” Kup said. The old veteran couldn’t understand how anyone could have a problem with the Curator. He’d been suspicious before his unsanctioned exploration of the undercity, but now he felt confident that the Curator had their best interests at heart. “I guess we’ll have to see what this Pavilion is,” said Ironhide. “I think I see it now,” Rodimus said, staring out the window. Everyone crowded together to take in the view. Outside lay endless ocean, yet something had just broken the surface, was rising from that sea even as the craft soared in toward it: a massive structure of all manner of levels and platforms, the base widening as the summit extended ever higher, until it became clear it was nothing less than a gigantic pyramid-island protruding from the middle of the water now pouring off it in sheets. “They had that under the sea?” Prowl asked in a tone of wonder. “Look at the sky,” Rodimus said. “Megatron doesn’t look too happy,” said Prowl. “He’s not the only one,” Ironhide muttered. The shuttle alighted on the very apex of the Pavilion. The Autobots stepped out to find the Decepticons already waiting for them. Amazingly, no one fired at anybody. That was partly because Optimus and Megatron had both impressed upon their followers the wisdom—if not the necessity—of heeding the Curator’s wishes. But it undoubtedly also was due to the sheer surrealism of the situation: the Autobots disembarking from the craft, staring at the Decepticons only about twenty meters away, at edge of the Pavilion’s roof. Though Megatron was certainly happy to try to provoke the Autobots into doing something that might bring the Curator’s wrath down on their heads. “Megatron,” Optimus said coldly, though he raised a hand in formal greeting. “I offered him no favors,” Optimus said stiffly. “Why you—” Jazz started forward, only to be held back by Optimus’s outstretched arm. He rose through a trapdoor that irised open in the middle of the roof, halfway between the two rivals. “I have a confession to make,” he said. “This ought to be good,” Megatron said. “Then you should tell us everything,” Optimus said. Everyone stared blankly at him except Optimus, who looked appalled. “You are our enemy,” he said. “Whereas you just lie,” Ironhide said. “Which is not Quintessa,” Megatron said, trying to get things straight. There was a moment’s stunned silence. “What do you gain from this?” Optimus asked. “Yes,” Megatron said to everybody’s surprise. “We cannot do that,” Starscream protested. Though his mind was on anything but that.